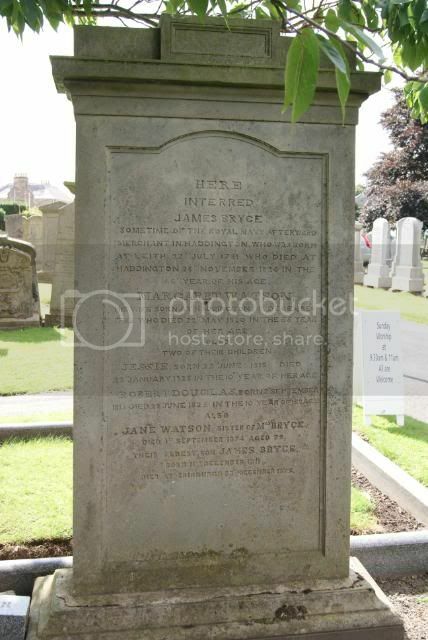 Here interred James Bryce sometime of the Royal Navy afterward Merchant in Haddington who was born at Leith 22nd July 1781 who died at Haddington 28th November 1826 in the 46th year of his age. 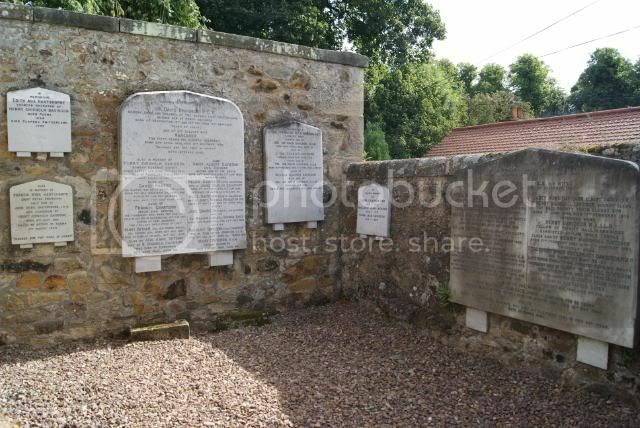 Margaret Watson his wife born at Haddington 3rd December 1785 who died 22nd May 1820 in the 35th year of her age also 2 of their children Jessie born 29th June 1813 died 23rd January 1823 in the 10th years of her age Robert Douglas born 2nd September 1815 died 28th June 1825 in the 10th year of his age also Jane Watson sister of Mrs Bryce died 1st September 1874 aged 79 their eldest son James Bryce born 11th December 1811 died at Edinburgh 23rd December 1879. Grave can be found at O2. Sacred to the memory of William Haldane late paymaster of Her majesty's 33rd Regiment of Foot and second son of Late Provost Haldane who died the 6th of May 1844. 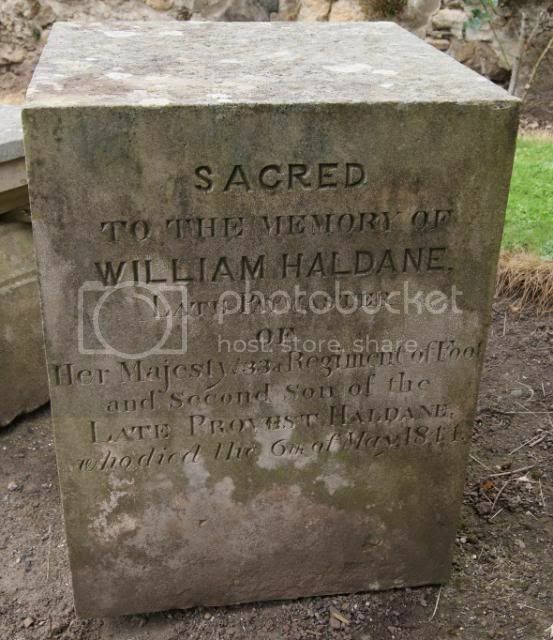 William was the second son of George Haldane (d 24 Sept 1822) married (14th June 1772 at St Mary's Parish Church Haddington) Catherine Murray (b 30 Jul 1751-d11 Dec 1809). George was a hosier, manufacturing woolen stockings. He was Provost of Haddington in 1811. William never married. George and Catherine had 7 children. John, William, Henry, Jane, Margaret and Isabella. 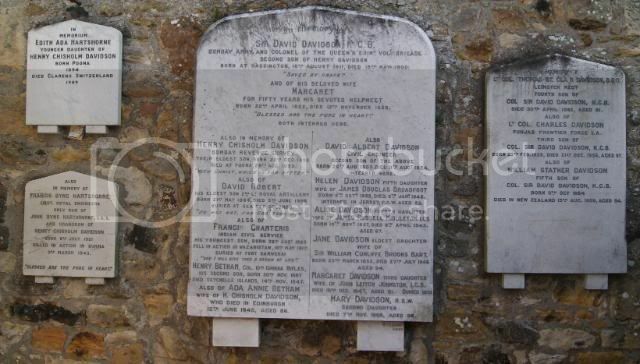 Robert and Jennet died in infancy. Augustus Satchwell Lieut. 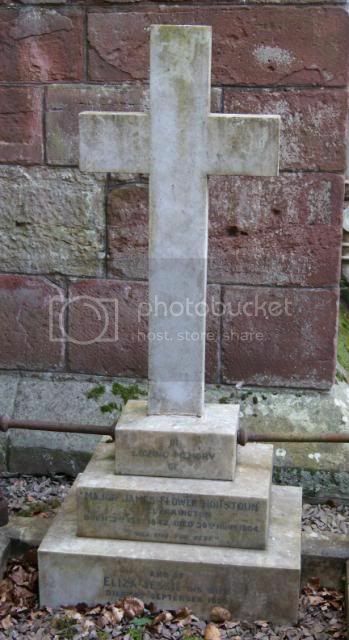 R.E 2nd son of James Gardiner Johnstone MD died at Ferozepoor East Lndies 20th December 1853 aged 25. 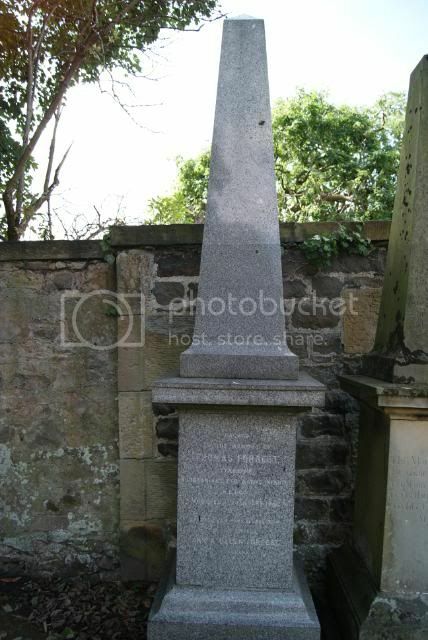 This monument has been erected by General Henry Campbell Johnstone CB eldest son of James Gardiner Johnstone MD. This grave can be found at S164. 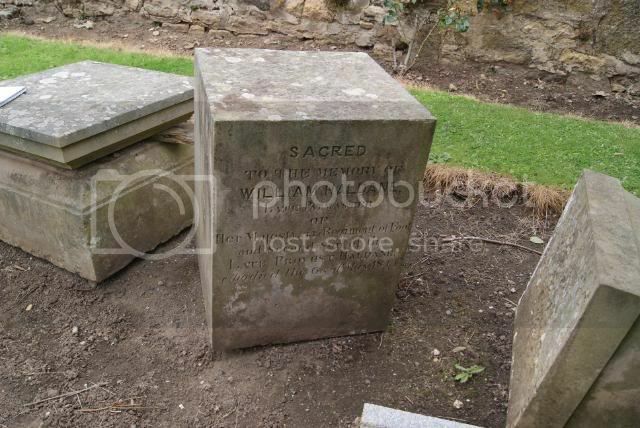 Johnstone - 2nd Lieutenant Augustus Satchwell - Bengal Engineers - died 20th December 1853. Son of Surgeon James Johnstone, MD (Bengal Medical Service). Born at Bareilly, 7th January 1828. Married Louisa Brownlow at Arrah, 4th September 1849. 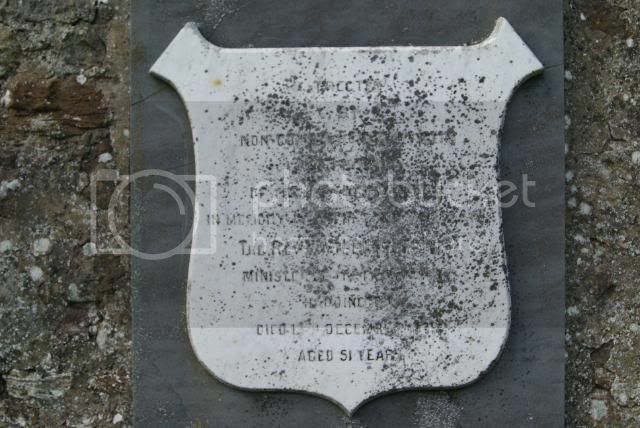 Grave at Ferozepore - "Beneath this tomb lie the mortal remains of Augustus Satchwell Johnstone 2nd Lieutt Bengal Engineers who died at Ferozepore on the 20th December 1853. Aged 25 years and 11 months. Blessed are the dead which die in the Lord." Augustus Satchwell Johnstone, Gent. 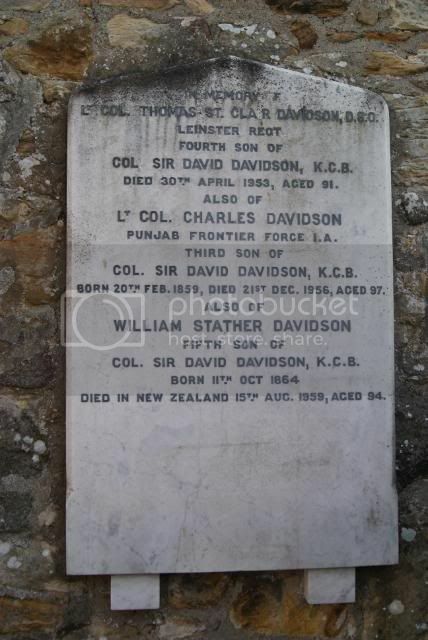 Dated 1st January 1847.
also to the memory of Francis Charteris Davidson, Major H.M 19th Bombay Native Infantry their 7th son born 11th November 1827 died at Bombay 22nd October 1873. 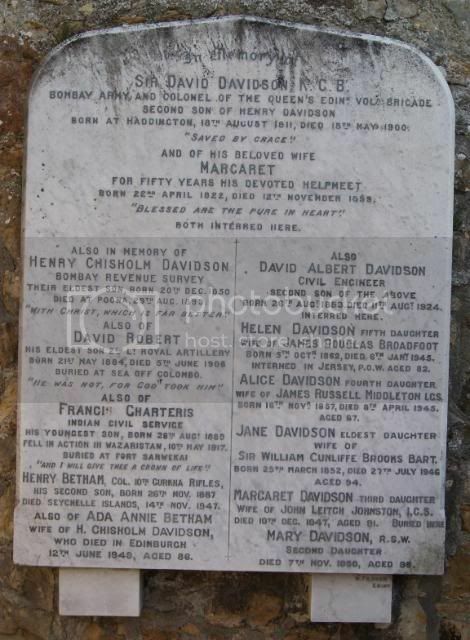 Andrew Fletcher Davidson Superintendent of The Revenue Survey Kandeish, their 5th son born 1st May 1823 died at Dover 20th June 1874. Janet Hume Davidson eldest daughter of Henry Marshall Davidson, Sheriff Clerk of Said County, their eldest son, born 1st June 1838 died 17th February 1878 interred here. Henry Davidson MA, LLB Fellow of Trinity Hall Cambridge, Barrister-at-Law Inner Temple elder son of Henry Marshall Davidson born 11th February 1837 died 7th January 1897 Interred here. 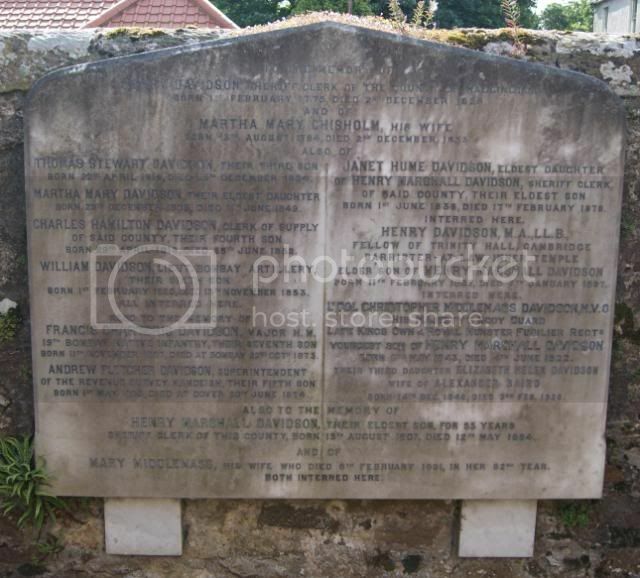 Also to the memory of Henry Marshall Davidson, the eldest son, for 55 years Sheriff Clerk of this County born 15th August 1807 died 12th May 1884 and of Mary Middlemass his wife died 8th February 1891 in her 82nd year. Both interred here. They had 3 servants, Janet Somerville, Margaret and Elizabeth Johnston. They had 3 servants, Margaret McFarlane (cook), Isabel Sharp and Jessie Bennet. Living in a Boarding House run by Janet W Brodie. 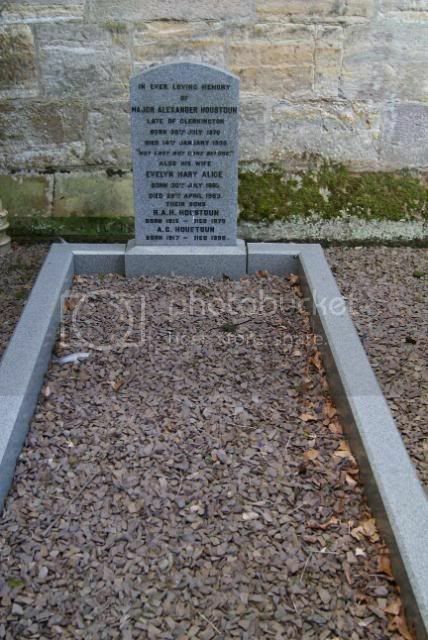 Lieutenant Colonel Christopher Middlemass Davidson died on 5th June 1922, at the age of 80. His home was at 14 Victoria Park. He was a member of HM King's Honourable Corps of Gentlemen at Arms from 5th May 1889 till his death. His will was proved in September 1922 at £7,644. He was born on 6th May 1843 and became an Ensign 4th Foot on 26th February 1862. On 19th March 1866 he was a Lieutenant, between 21st April 1875 and 22nd June 1876 an Adjutant of the Auxiliary Forces, and between 24th July 1868 to 1st January 1869 he was an Adjutant. He was made Captain of the 4th Foot on 23rd June 1875, and Captain of the 104th Foot on 23rd October 1875. He became Major of the Royal Muster Fusiliers on 1st July 1881, and retired as honourable Lieutenant Colonel on 10th June 1882. In 1904 he became a Dover Town Councillor. His son, Lt Francis Coventry Dudfield Davidson was killed in action on 23rd February 1900 in the South African War. He served in the 4th King's Own Royal Lancashire Regiment, becoming 2nd Lieutenant on 6th March 1895, and Lieutenant on 1st January 1897. He is commemorated on the South African War memorial in St Mary's church. Another son, Captain Christopher Edmund Grant Davidson was killed in action on 13th October 1915. He was in the 1st battalion, attached to the 6th of the Buffs (East Kent Regiment). A third son was Major Hugh Alan Davidson, DSO (London Gazette 1st January 1917), Bar to DSO (London Gazette 26th July 1918), of the Royal Army Medical Corps. He was born on 25th May 1875, became Lieutenant on 29th November 1900, Captain on 29th November 1903, Major on 29th August 1912, Temporary Lieutenant Colonel on 15th September 1915, Lieutenant Colonel on 13th September 1918, and retired on 29th May 1920.
and of his wife Margaret for 50 years his devoted helpmeet born 22nd April 1922 died 12 November 1899 both interred here. Henry Betham Col. 10th Gurkha Rifles his 2nd son born 26th November 1887died Seychelle Islands 14th November 1947 also of Ada Annie Betham wife of H Chisholm Davidson who died in Edinburgh 12th June 1949 aged 86.
also David Albert Davidson Civil Engineer 2nd son of the above born 26th August 1853 died 11th August 1924 interred here. 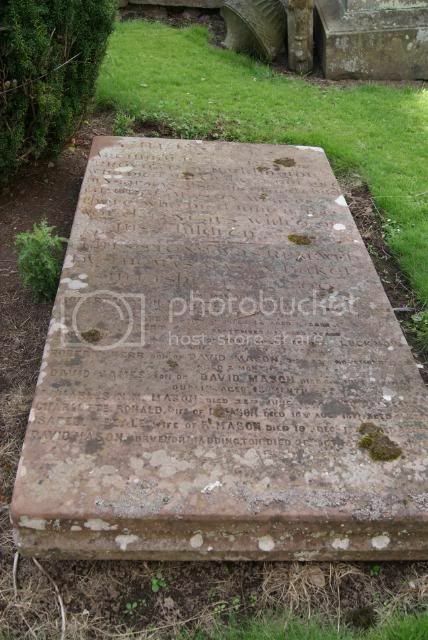 Here lies Archibald Miller late Provost of Haddington who died March the 9th 1701 aged 31 also his grandchild George Mason, weaver there who died June 18th 1782 aged 42 with 9 of his children. This stone was renewed by Thomas Mason, baker in Fisherrow 1809. In memory of Robert Mason, Nungate died 20th August 1845 aged 50 also three of his sons Robert died 4th June 1824 aged 8, Robert died 9th September 1835 aged 3, Andrew of the 73rd Regt of Foot killed before Lucknow 9th March 1858 aged 37. Robert Kerr son of David Mason died 22nd November 1856 aged 2 months, David James, son of David Mason died 6th July ___ Dublin aged 18 months, Charles N M Mason 28th June 186__ aged 2, Charlette Ronald wife of David Mason died 16th August 1871 aged 41, Isabella A Beale wife of R Mason died 19th December 1872 aged 82, David Mason, Surveyor Haddington died 26th October 1876 aged 51. This grave can be found at R18. 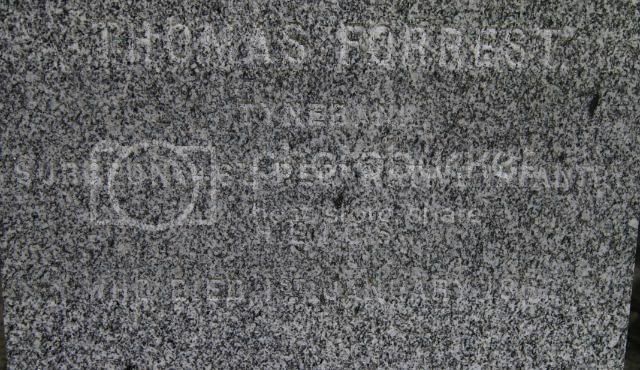 Sacred to the memory of Thomas Forrest Tynebank, Surgeon 46th Regt Native Infantry HEICS who died 1st January 1862. Erected as a mark of affection by his sisters Ann and Helen Forrest Tynebank Anno 1863. This grave can be found at U4. They had one servant, Marion Young. No sign of Thomas in 1841 Census. They had 2 servants, Elisabeth Rogers and Margaret Forrest. 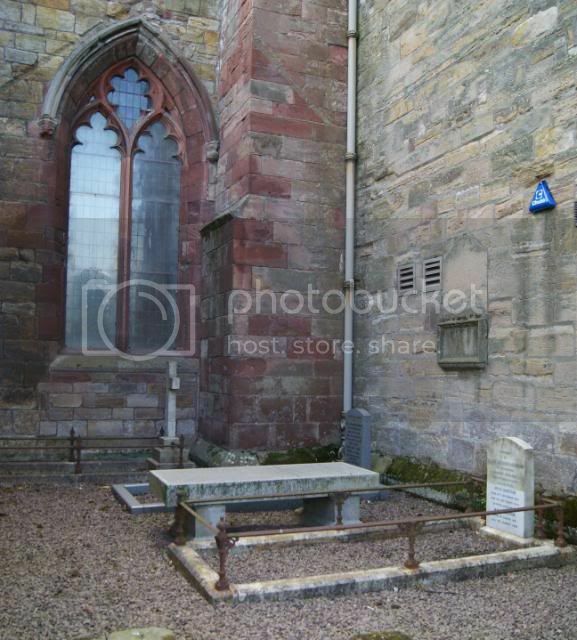 The Houston's of Clerkington Family plot is in Section N, which is enclosed on 3 sides by the walls of the Church. Sacred to the memory of Anne Caroline Houston wife of Colonel Alexander Houston of Clerkington Haddington died 26th October 1870 aged 57. scared also to the memory of Colonel Alexander Houston of Clerkington died 9th October 1874 aged 67. 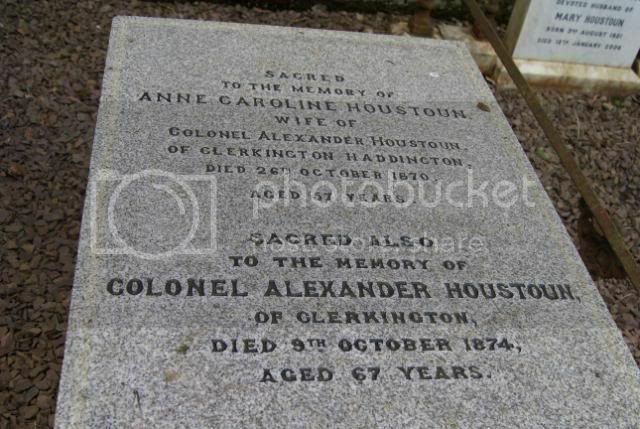 Alexander was the 3rd child (2nd son) of Robert Houston and Frances Caplain Folliot. He was born c 1806 at Clerkington East Lothian, he married Anne Caroline Percival in 1835. She was the daughter of Michael Henry Percival. They had 4 sons. Wallace Charles Houston born c 1836, Robert Alexander Houston born 1838, 6th of Clerkington, d 1879, James Flower Houston born 1842, 7th of Clerkington, died 1904 and Michael Henry Houston born 1845, JP of Beech Hill died 1916. Alexander was Colonel of the 34th Regt of Foot and 4th Light Dragoons. In memory of Major James Flower Houston of Clerkington born 2nd February 1842 died 30th November 1904 and of Eliza Jessie his wife died 4th September 1929. 1. On 27th April 1869 in Bengal to Selina Jane Nicolay b 8th Dec 1838 in Madras India died 11 Oct 1878 England, daughter of Lt.Col Frederick Lewis Nicolay HEICS (b 13 Feb 1806) and Clara Briggs (b1814). 2. In 1879 to Eliza Jessie Johnston, born in Brazil (Brit Subject) daughter of Carruthers Charles Johnston, she died 4 Sept 1929. 1. Mary Isabel Dorothy Follett Houstoun, b 1882, married on 30 April 1910 to Reginald Henniker-Heaton, son of Sir John Henniker-Heaton 1st Bt and Rose Bennett. She lived in Haddington and was Deputy Lieutenant (DL). He was a Captain in the Royal Navy. 2. Robert Henry Follett Houstoun (Robin), b1885 married on 26 June 1913 to Ida Mary Dorothy Davison, b Sept 1889 Sevenoaks, Kent, daughter of Arthur Pearson Davison and Dorothy Georgina Mary Norris. They have 2 sons and 1 daughter. Major Alexander Houstoun was the eldest son of Major James Flower Houstoun and Selina Jane Nicolay and grandson of Colonel Alexander Houstoun and Anne Caroline Percival. 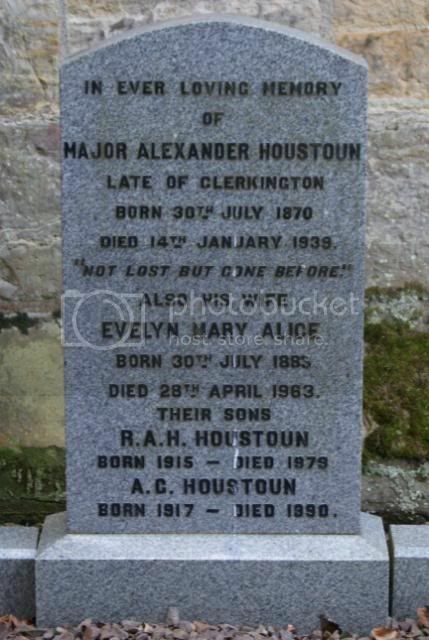 He married on 8th August 1914 to Evelyn Mary Alice Houstoun-Boswell, daughter of Sir George Lauderdale Houstoun-Boswell of Blackadder 3rd Bt and Phoebe Allan. He lived at Mayshiell. He gained the rank of Major in the Royal Field Artillery. They had 3 children - Robert Alexander Hugh Houstoun 1915-1979, Andrew George Houstoun 1917-1990 and Bryce Houstoun b 1924. To the memory of Col. Sergt. Duncan Campbell Anderson of the 78th Highlanders and Sergt. Major of the Haddington Volunteers who died here May 18th 1878 in the 50th year of his age. The grave can be found at T37. Erected by Non-Commissioned Officers and Privates of the 47th Highlanders in memory of their late Chaplain The Revd William Ross Minister of the First Charge Haddington died 13th December 1879 aged 51. This marker can be found on the Churchyard wall at V6. Erected by members of the Haddington Troop of the ELYC in appreciation of Sergt. Major Walter Bennett who died 9th January 1888 aged 39. Not dead but gone to Jesus. The infant son of W Bennett born 17th June 1884 died 23rd September 1884 Milligent Ellen his youngest daughter died 31st March 1888 and interred in Hanwell Cemetery aged 20 months. This grave can be found at D56. Three troops were raised in 1797: the Seton Troop; the Salton Troop; and the Gifford Troop. The Seton Troop's guidon includes a grab or wheatsheaf. A fourth troop, the Dunbar Troop was raised in 1803. The Salton, Seton and Gifford Troops disappeared in 1827 and the corps was disbanded in 1837. The East Lothian Y.C. was re-raised in 1846 as two troops and was added to in 1848 by a Berwickshire Troop. This gave rise to the first unofficial title of The East Lothian and Berwickshire Yeomanry Cavalry. A new troop was added from Midlothian in 1879. Surgeon Major Robert Lewins M.D died 22nd July 1895 aged 73. 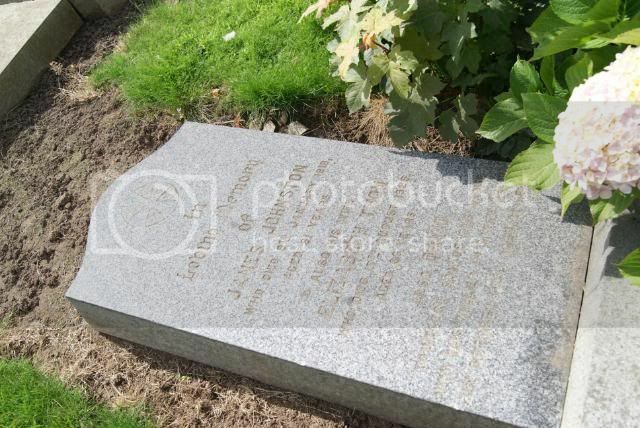 This grave can be found at U19. They had 3 servants, Anne Davidson, Jane Gillon and John Slade. The British Medical Journal - Naval and Military Medical Services, p 395 August 10th 1895. 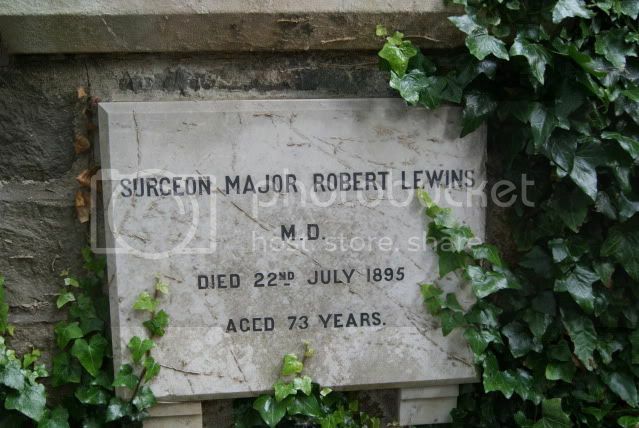 Surgeon-Major ROBERT LEWINS, M.D., died at Nottingham Place, London, on July 22nd. He entered the service as Assistant Surgeon, December 13th, 1842; became Surgeon, March 3rd, 1854; Surgeon-major, January 21st, 1866; and retired April 24th, 1868. He served with the 63rd Regiment in the Eastern Campaign of 1854, and up to January 13th, 1855, including the battles of Alma, Balaklava, and Inkerman, and siege of Sebastopol, receiving the medal with four clasps and Turkish medal. He was also in the expedition to the north of China in 1860 in charge of the hospital ship Mauritius, and was present at the capture of the Taku Forts, receiving the medal. In 1832 two physicians in Leith, Edinburgh, Dr. Thomas Latta and Dr. Robert Lewins, used intravenous saline to save the lives of sixteen of their patients with cholera. They were the first to use intra-venous fluids to rehydrate patients. It was some 60 years before it was used again! In loving memory of James Johnston who died 6th January 1918 aged 81 also his wife Elizabeth Thom who died 17th August 1926 aged 86 also David youngest son of the above who was killed in South Africa 21st October 1899 aged 21. This grave can be found at S37. 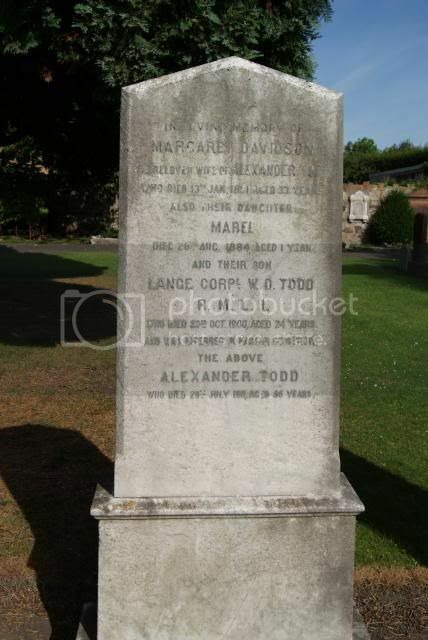 In loving memory of Margaret Davidson the beloved wife of Alexander Todd who died 13th January 1891 aged 33 also their daughter Mabel died 20th August 1884 aged 1 and their son Lance Corporal W D Todd R.M.L.I who died 23rd October 1900 and was interred in Haslar Cemetery. 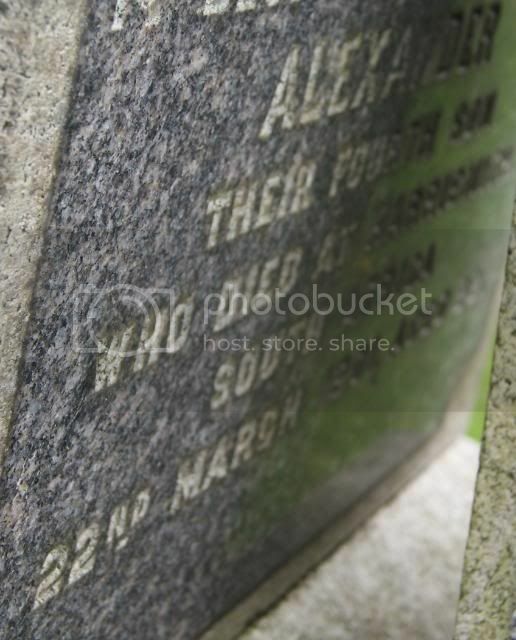 The above Alexander Todd who died 29th July 1911 aged 55. This grave can be found at B4. 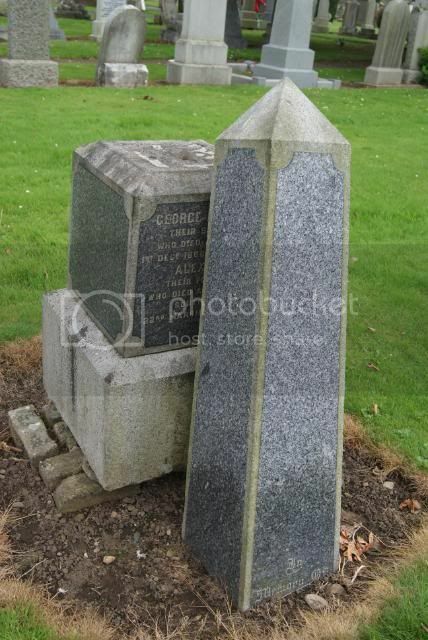 In memory of George Robertson their 2nd son who died at Arbroath 1st December 1868 aged 4 months, Alexander their 4th son who died at Harrismith South Africa 22nd March 1901 aged 22. As you can see from the photos the top of the obelisk appears to be firmly imbedded in the ground and covering part of the inscription. Also the obelisk has been set infron of the stone making it difficult to read, and even more difficult to take a photo! 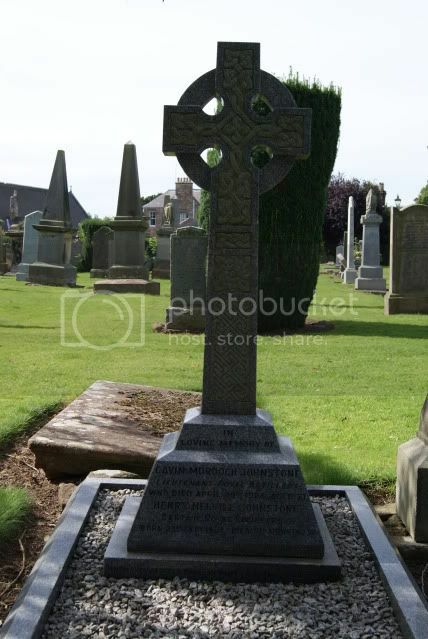 In loving memory of Gavin Murdoch Johnstone Lieutenant Royal Artillery who died April 30th 1905 aged 21. 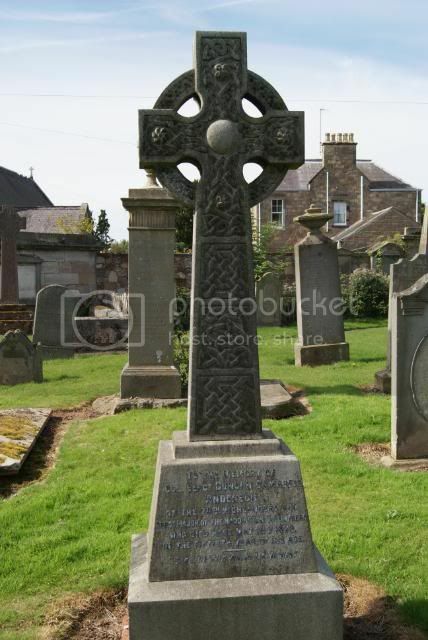 Henry Melville Johnstone Captain royal Engineers born 23rd February 1857 died 2nd November 1923. Their daughter Alecia Jervis widow of Lt Col C S Cameron Indian Cavalry born 2nd January 1886 died 8th May 1972. The grave can be found at S165. Memorial to Gavin within St Mary's Church. 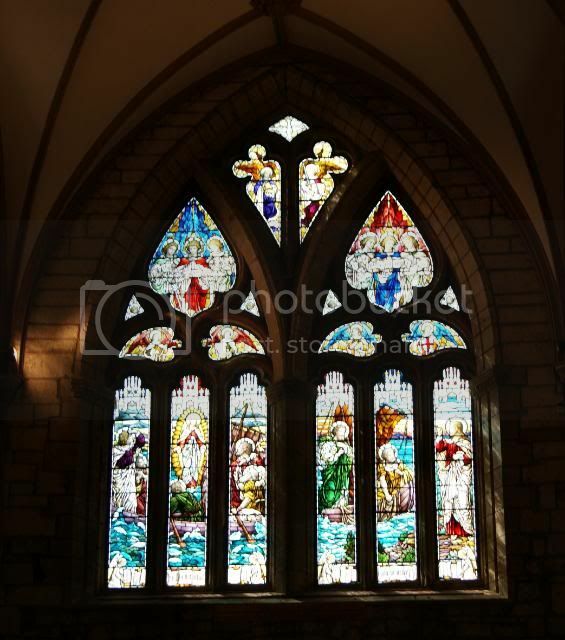 The great west window in St Mary's Parish Church Haddington, is in memory of Lt. Gavin Johnstone who was accidently drowned, age 21.